James came to Project 82’s House of Hope in May 2015. Since then, he has really grown. 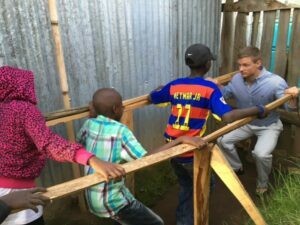 He has made new friends in Molo, and counts Gideon as his best friend. James’ favorite subject at school is math, and when he isn’t studying, James loves all sports. James is currently in class 2 (2nd grade) and would like to be an aircraft engineer when he is big. We are excited for Victor today! 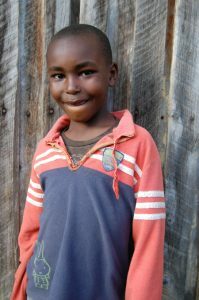 Victor left Neema House to live with his aunt. 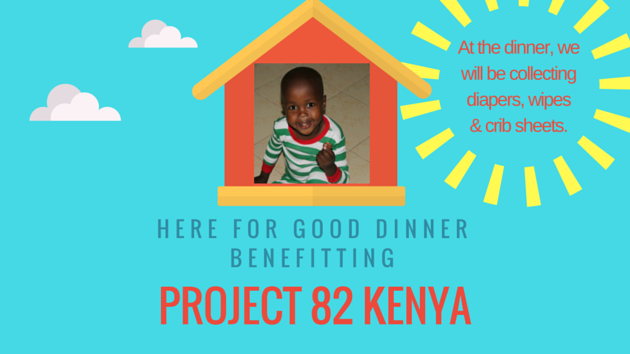 Project 82 will support the family with formula and medical care for a few months while they get settled. We praise God for the time we got with this sweet, sweet boy. He really brought so much joy to our house. 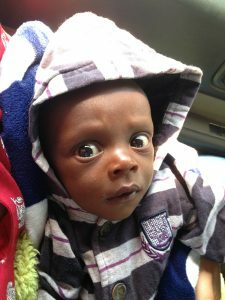 Welcome George, our newest little guy at Neema House! He will be staying with us for a while to gain weight, and get strong and healthy until he can be reunited with family. Our Infant Rescue Ministry is a caring place for children to stay for a time before going home to their loving forever families. Are you hearing the call from God to provide for the weak and defenseless? If so, take a step of faith today. Say YES, and see how He’ll use your willingness to transform families. 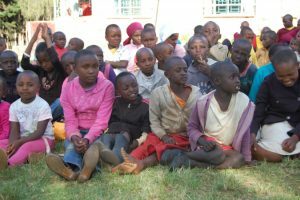 At Project 82 Kenya, each $38/month* child sponsorship provides for basic needs, medical care, education fees, required school uniforms, and perhaps most importantly, to learn about the love of Jesus. Unlike other child sponsorship programs, Project 82’s commitment to our children doesn’t end when they turn 18. We continue to focus on sustainability programs and life skills training so that our kids have the ability to support themselves. At Project 82, we encourage building a relationship with your child, one of the many blessings of child sponsorship, through letter writing or our monthly video calls. To learn more, please contact Pam McLerran. Thank you for your mercy and compassion for the children of Kenya! *It takes more than one sponsor for each child to be fully sponsored. Executive Director, Anita Colley, will discuss future plans for Neema House. Annie Coppedge, Project 82’s missionary at Neema House infant rescue center, will share about a “typical” day in ministry. Three on a String will provide musical entertainment. Dress is business casual. *To reserve your seats, click tickets link above, type in amount (100, 200, etc.) and select “here for good dinner” from drop down menu or send a check to Project 82 at PO BOX 680003, Marietta 30068. Deadline to purchase tickets is Sept 6. Questions: Contact Gayle Haden, 770-977-7114. 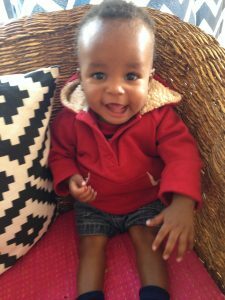 If you plan to bring diapers to donate to Neema House, here are links to the cloth diapers we use. Today we split into two groups: some of us attended ILI training while the rest of us took the Project 82 preschool kids to an animal rescue center in the beautiful Fairmont Mt. Kenya Safari Club. 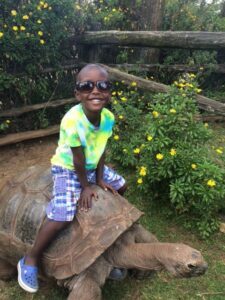 The children loved seeing the animals up close and personal, including Caleb who rode on the back of a 150-year-old tortoise! Some were a little afraid — like Sammy– but thankfully, he had Barbara (or Gigee!) to protect him! We met back at Neema House for a delicious lunch of grilled cheese sandwiches and chips. How on earth can something so simple be SO GOOD? I don’t know, but many of us we agreed it was one if the finest meals we’d eaten in Kenya … Or maybe ever! When we tried to get back on the bus to return to ILI and the big kid Neema House, our bus was blocked in by two mistimed loads of rock dumped on the road. Our driver Joseph tried to get around the rocks and became stuck in an intractable trench. Gabe prayed over the unfortunate situation and then everyone set to work to get the bus unstuck, with the neighbors coming out to help. We were so relieved when it finally rolled free! The ILI group gathered to do street evangelism, while the others traveled to the big kid Neema House to have a birthday party for Isaac and twins Alice and Lily. The “grandmas,” Barbara and Lynda made sure the party room was beautifully decorated and delighted in watching the kids open their presents. The team (minus a couple germophobes) loved the Kenyan birthday tradition where the birthday kids serve every person at the party a bite of cake. When it started to pour rain outside, the big presents of three bikes with training wheels were hustled inside and the kids rode them around the living room in circles! Later that night, we learned that both Gabe and Conor were part of leading three young people to Christ during the street evangelizing time. Gabe told the young lady he talked to that the angels were rejoicing in heaven at the very moment she accepted Christ as her Lord and Savior, and don’t you know they were and are! Gaylyn reminded us later that there is no more important work that we can do than bringing people the good news of the Gospel. Because these two young men were willing to “GO” (Matthew 28:18), they were chosen to take part in God’s plan of salvation for three precious lives whose eternities are now secured. Matt reminded us that we can have a passion for the harvest right in the place we live, and he encouraged us to consider how we can live that out effectively when we return from Kenya. Gayle reminded us of what a privilege it’s been to work with everyone on the team, but especially to see Lynda and her grandson Gabe come and serve together in Kenya, a desire that Lynda has expressed to her friends and family for several years. Carey closed our final evening together in Kenya by reading Scripture’s account of the last supper, where Jesus washed the feet of the disciples, an expression of God’s love for us “made complete.” Then, as the Lord asked us to do, we washed each other’s feet as an expression of our love for Him, made complete. We are so grateful for the support of each of our prayer partners and family members and for all the ways that you sacrificed and prayed to get us to this place. All of you are in our hearts, and our families have expanded hugely this week to include YOU! Pray for safe travels and a sweet time of reunion when we all return home. Today was our game drive. 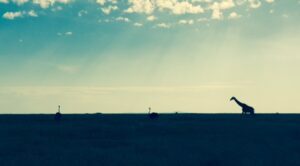 We were loaded on the bus and on the road by 6 a.m. Our collective wish and goal was to see a lion, although this kind of sighting is rare and never guaranteed. Our guide, “Prince” Charles, showed us many amazing sights, including birds, giraffe, elephants, zebras, and rhinos. After a stop at the enclosure of the blind rhino, Baraka, some of us were waiting for coffee when we got word a lion had been sighted about 2 kilometers away! We jumped back on the bus and headed there. Shortly, we saw two lionesses walking through the grass to lie down in the shade. A bit farther in, and we got our wish: a big male lion guarding the fresh kill of a baby giraffe. A once in a lifetime moment! Bob opened our devotion time that evening with Genesis 1:20-25, which was fitting after experiencing such wonders of God’s creation. After our thrilling safari, it was back to work! The men and Gayle took over at Neema House (with the help of a couple of Kenyan substitutes 🙂 so that Annie and the P82 staff caregivers could come back to Old House for a women’s retreat. While the guys took over diaper, laundry and feeding duties for 17+ babies, the women had lunch together, opened gift bags, gave prizes, distributed Bibles, studied Ephesians 1 and washed feet. Our goal was to honor these wonderful caregivers who are Christ’s hands and feet every day for vulnerable babies. On Monday, the P82 team visited the guardian sewing center. Simon, whose mother and sister are in the program, proudly gave us the “tour” of a small classroom filled with Singer sewing machines where the women are learning to sew school uniforms and other items that they can sell to earn a living for their families. Esther, one of the students, shared with us us how the program has already affected her life and the dreams she has for her own future and for the futures of her two kids. Esther rises early each day so she can make money cleaning for a nearby business before coming to sewing class by 9 a.m. Esther’s beautiful, dimpled smile and steely determination to improve her family’s circumstances and to be a role model for the others in the sewing program was remarkable and encouraging. When we, back at home, give of our resources to sponsor a guardian in Project 82, we are able to touch the lives of a whole family and beyond. After visiting the sewing program, the team returned to the House of Hope to drop off the men, who would be spending the day repairing a swing set for the kids and building new tables for the homework room. The women picked up the house moms for the first-ever Project 82 women’s house mom retreat. The retreat took place on the beautiful grounds of Ukarimu, where our team stayed for the first half of our trip. Our goal was to honor and pamper these dear women who give so much to so many children in need. After eating a delicious lunch prepared by the nuns, we brought the ladies to a room we’d decorated with a “fruit of the spirit” theme. They opened gift bags stuffed to overflowing with thoughtful, fun items donated by our friends back home, including notepads, stationery, hygiene kits, hair accessories and handmade, knitted bags and prayer stones made by a very special Mt. Bethel knitting angel. The women were delighted with every gift and began trying on the headbands, combs and barrettes right away! It felt a little like Christmas morning. One of the most moving moments came when Gaylyn explained to the house moms that the women of The Garden (a safehaven for homeless moms and their children in the US) had written them personal notes of encouragement. These tender-hearted Kenyan women could not conceive of a situation where a woman would be “homeless.” Christ-like compassion for the women of The Garden poured from the house moms, and they wept. They each could not wait to write notes of encouragement back, and as a group, we decided to answer the question, “How are you?” with the words used often by the women at The Garden: “We are blessed and highly favored!” It was a sobering and humbling moment for all of us. After distributing and inscribing Bibles to each woman, Gaylyn gave a teaching on Ephesians 1, where Paul reminds us of who we are in Christ. We ended our time together by washing their feet and praying over each woman individually. As we piled back on the bus, now as sisters in Christ and more than friends, our hearts were light and spirits refreshed. We sang songs, danced in the aisles and acted like the bunch of girls we are! Back at the House of Hope, the men had accomplished their goals despite many obstacles, including having to create S hooks by bending metal by hand! Thanks, Pearce and Gabe! As Carey and P82 university students Simon and Jonah worked together sawing wood for the tables, the work became much more about building relationships than building tables. Ben said he will not forget seeing a retired Bank of America vice president on his knees humbly washing dishes. Mark and Matt said how good the colloboration was, with every person contributing something unique to be the body of Christ. When the ladies pulled back in to the House of Hope, children were happily swinging on the repaired swingset, and our brothers may or may not have been watching Chinese soap operas dubbed in English. (Go figure that one.) The kids ran to the bus to greet their Aunties and smother them in hugs and kisses. Goodbyes, as usual, were bittersweet, but we are indeed blessed and highly favored! Sometimes the Lord speaks to us in very distinct, clear ways. Sometimes His voice is quiet and hard to hear. It’s interesting how he sometimes chooses to bring us away from everything familiar in order to have a conversation with us, even across the world to Kenya! Sunday morning started with a moving devotion from Conor in which he shared with us how the Lord had cleared every obstacle and brought him to Kenya. All that he was experiencing and his feeling that the Lord was drawing him back to Himself was confirmed when he saw a young Kenyan boy wearing a bracelet yesterday with symbols representing the words “God is greater than my ups and downs,” the same symbols as on his teammate Gabe’s tattoo! It was a clear message to a heart hungry to hear from his Heavenly Father. 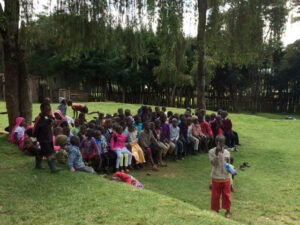 We attended the African Inland Church with our P82 kids. It was an exuberant time of worship with our Kenyan family. Again, God spoke to us through everything from the Scripture quoted, which was discussed in Mark’s evening devotion the night before, to the music which included a Kiswahili rendition of How Great Thou Art, a song of special significance to some of our team members. Carey delivered a great message about the power of the Holy Spirit. After church, we were split into small teams — three of us and a translator — and we went on home visits. The intimacy and laughter shared while preparing food together is such an equalizer, and we all shared later how comfortable we felt in the homes of our Kenyan families. God delivered perhaps His most amazing message today to Pearce and Gaylyn, whom He orchestrated to visit Esther’s home. Esther’s husband died a few years ago, leaving her with two young children. Her family rejected her because she had converted to Christianity from the Muslim faith when she married. With no place to go and no means of support, she lived for awhile in the IDP camps but the atmosphere was an unhealthy one for her children. Her mother-in-law took her in, and the family entered P82. Every Saturday of the month, there’s a party at the House of Hope. It resembles a family reunion in our American South. The number of children swells from the 40+ who live in the House of Hope to around 150 in the community who are part of the Project 82 program or may be eligible to join. About 40 guardians also come, and the house moms and guardians prepare a traditional Kenyan midmorning meal of tea and porridge for the little ones and later a huge hot lunch of rice, shredded carrots and cabbage, meat stew and chapati (a bread commonly made for special occasions) for everyone in attendance. While the adults cook, a local pastor leads a Bible study for the children, and they play together outside. This past Saturday, our team was able to attend this one-of-a-kind Kenyan “family reunion!” What a joy! In the morning, Matt led the kids in a simple version of Vacation Bible School, while Gaylyn and the young adults broke out with the P82 teens. Simon, an excellent young man in the program who now attends university, was our translator for the younger kids. When we broke out into small groups, it was awesome to hear the children recite their favorite Bible verses. Several of the kids in my group recited from the book of John where my own favorite verse, John 15:5, appears. After lunch, as we watched the kids play net ball, one of the girls who adopted me for the day–Naomi–curled up next to me in the grass, pulled her sweater up over her head and fell fast asleep. Her friend, Lucy, laid a protective arm over her and rested her head on my shoulder. Such a sweet moment of trust and the intimacy of “mothering” that we take for granted with our own children. 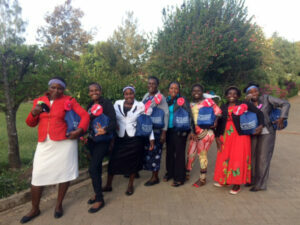 In the late afternoon, the team passed out letters and packages from sponsors. It was special to witness the looks of anticipation and their wide smiles as they received their letters and packages. Several of our team members met the children they sponsor. Ben reminded us later that night that although the need feels so large and sobering at times, we do make a difference with these kids, one child at a time. He got to experience this philosophy tenfold when he was able to meet with one of his and his wife Betty’s sponsored children, Mary, who is starting her first year at Kenyatta University. Mary’s mother died, leaving her and her siblings in an orphanage when the girl was 11 years old. She never knew her father. Through her sponsorship at P82, she was able to attend school and later achieve a passing score on the national test to be accepted into university. That evening, back at Ukarimu, we heard the stories of two of our P82 Kenyan friends, Dan and Gordon. Their testimonies humbled and encouraged us. What we heard most clearly was their steadfast belief, even in the darkest of times, that God had good plans for their lives (Jeremiah 29:11) and that He would NEVER leave or forsake them. (Deuteronomy 31:8). No matter where we live, what circumstances we face or who we are, these are promises we can also cling to. God bless!